Body corporates have a lot of duties and responsabilities for ensuring common property and body corporate assets are well maintained. Keeping on top of everything can be quite stressful, you’ll need a reliable plumber, electrician, pool maintenance people, gardener and many other professionals depending on your shared services. Oasis Tree Management are available to take the stress of your tree removal, tree pruning and tree maintenance needs. Why do I need a tree management service? Depending on your Body Corporate arrangement, you might be responsible for a number of areas. The owners have contributed to a sinking fund and it’s your responsibility to use this money wisely to maintain the grounds. Should the shared grounds you manage have large trees you might need to consider a tree maintenance programme. It will save you money in the long run. Making the cuts now, can save you money in the long-run. Tree pruning is important. Should you have trees that overhang tenant’s roofs, it is the responsibility of the body corporate to ensure that they are pruned accordingly. Should you fail to get organise tree pruning the leaves and debris that fall from the trees can block the gutters of a tenant’s roof and this can lead to very costly issues. Gutters are your one line of defence from the weather. When the gutters are blocked and the water has no other way to escape, a heavy downpour can see a stream of water flowing off your roof. This water can pool around the foundations, and if left to fester can cause rot and damage. Tree pruning will also prevent leaf build up on your roof. Leaves are really good at holding moisture, which is something you don’t want on your roof, as it can lead to costly repairs. Lot owners will not be happy if they’re roof structure is compromised, and most insurance companies will void an insurance policy should the gutters be blocked. This means expensive repairs will come out of the sinking fund, which could lead to rising body corporate levies and unhappy lot owners. Blocked gutters can also be a fire hazard, and in Brisbane, with our sub-tropical climate it’s important to be fire safe as your insurance will be void if you don’t take the necessary precautions, such as regular tree pruning and tree maintenance. During storm season especially, high winds and heavy rain can take its toll on the trees and this can lead to branches falling and in some cases even trees. The body corporate is responsible for any damage to a lot owner’s property caused by trees on the common grounds. Should there be a lack of tree maintenance and tree pruning, your insurance will be void and the funds will need to come from the sinking fund, which can once again push up the body corporate levies. If you have a pool in the common area that has trees around it, tree pruning and tree maintenance is especially important. Leaves can clog up the pool drains and cause contamination, not to mention how unsightly they look. 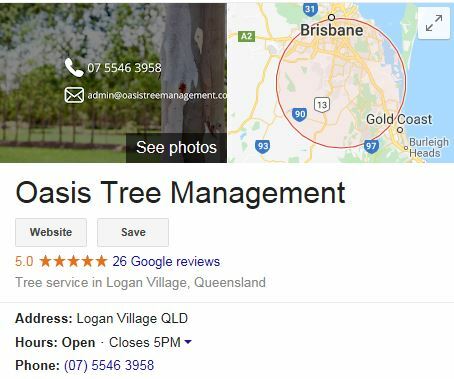 Have Oasis Tree Management on speed dial. If a tree’s causing you problems, our tree removal service is second to none. Keep your grounds clean and clear with regular tree pruning and tree maintenance.